Posted by Amy on February 23, 2013 in Considered opinions, Fast & Easy, What's for Dinner? Finally, I have a little something to write about! I cooked something new this evening! Let me tell you about it. . . . But first, the back story: while I was in college (1991 to 1996) I was, out of necessity, forced to cook on Sunday for an entire week. You see, after working a 40 hour week, I went to Tulane University at night. For five years. No kidding. One semester I took a Saturday class, too. If I didn’t get some sleep during the week, I had to wait until Friday night to get some. Hardest thing I’ve ever done, and likely is why I’m frequently tired to this day. But hey–wasn’t it worth it? I graduated from Tulane! I still do this weekly, even though I have been unemployed since June. I do cook at night, but try to get as much done on Sunday as I can, even if it’s boiling a dozen eggs for a week of breakfast. Yesterday I had to go down to someone’s house and pick up mail, and stopped at the Target in League City for a couple of things (one of which was bathroom tissue, OK?) I decided to buzz through their meat department and see what might be on sale. Sacre bleu! Red tags everywhere! Sausages! Grass-fed beef! Chicken Thighs! All with $2 and $3 off tickets! Let’s just say my freezer is REALLY full right now. My favorite Bare Chicken was $3 off each packet–I couldn’t resist, I bought four flat-packs of chicken thighs, the best part. I am happy. Today I had a couple of stops to make, one of which was Kroger. I saw some Crimini, aka “Baby Bella” (Portobello) mushrooms on sale. Immediately I thought of this recipe that has been sitting on my cookbook stand for months. I just ignored it while I made other things (like the acorn squash dish. Again.) I looked at it and realized I needed mushrooms, for one thing. So I took out one packet of chicken thighs and proceeded to thaw them in repeated courses of hot water in a baking dish. Took a while, but it worked. Mostly. Hey–the dish is fine. So here’s the recipe from last year’s Everyday Food Light book for EFChickenCacciatore. For many years, I have been partial to Nigella Lawson’s Pollo alla Cacciatore, because a) I saw her make it on TV and b) it’s darn good. But when I got this book when it published last year, I wanted to try it when I got to the winter dishes. Then, life happened. Truth to tell, there are lots of great recipes in this book, separated by seasons. During the summer, I made both the Grilled Tilapia with Cherry Salsa and a pork chop recipe with a peach/onion relish. Both are AMAZING and absolutely delicious. “Diet?” Forget it! I gave my elderly neighbor one serving of each, because her gourmet-cook sister was out of town for a while, and I didn’t want her to starve while her sister was gone. (I always say that to her when I bring over something to try–and she loves it.) Actually, she can cook, she’s just not the kind I am, or her sister. I bring her delish food occasionally, although she fussed at me the last two times because I wasn’t working. But she enjoyed them just the same. This dish really was as easy as they say it is, and it was pretty tasty, too. Four servings in about fifteen minutes. Now, I have to say that although this dish is easy, you MUST read the directions before proceeding. Why? Well. . .I put the chicken in with the mushrooms and garlic, and realized it just before I microwaved it for 2 minutes. I was picking the chicken bits out by hand, which made it longer than 15 minutes. DUH. Confession: back in the 80’s, I attempted to cook a Thanksgiving turkey in a microwave. Well. . .I was a military wife in far-flung North Carolina in 1984, where you still had to talk to an operator to make a long-distance call. Heck, any call when I first got there. The results were not bad, just not something to be proud of. I had a bigger microwave than I have now. Obviously I learned how to correctly roast a turkey later. My spouse and his buddy ate it and were nice about it, since we were all far from home. That part of my life is long over, although I do have an affection for Marines because of it. Do not try to cook a turkey in a microwave, OK? Maybe little turkey parts, but not a WHOLE turkey. At least give me points for ingenuity. All us foodies will miss Everyday Food magazine in the new year, but the website and the books will live on. If you’re planning to cut calories this year, Everyday Food Light is a good place to start. The recipes generally have less than 10 ingredients that are readily available, and all of them are under 500 calories per serving. (That means if you eat the entire recipe, it’s 2,000 calories, and you shouldn’t eat anything else today.) Check it out and see what you like. Me, I’m leaving alone anything with tofu or edamame in it, since I’m allergic to soy. But there are plenty of recipes to chose from, plus you can always go to the website to find something else. I hope to eventually get the other two Everyday Food books; but who knows, there could be one or even two more published under that moniker. 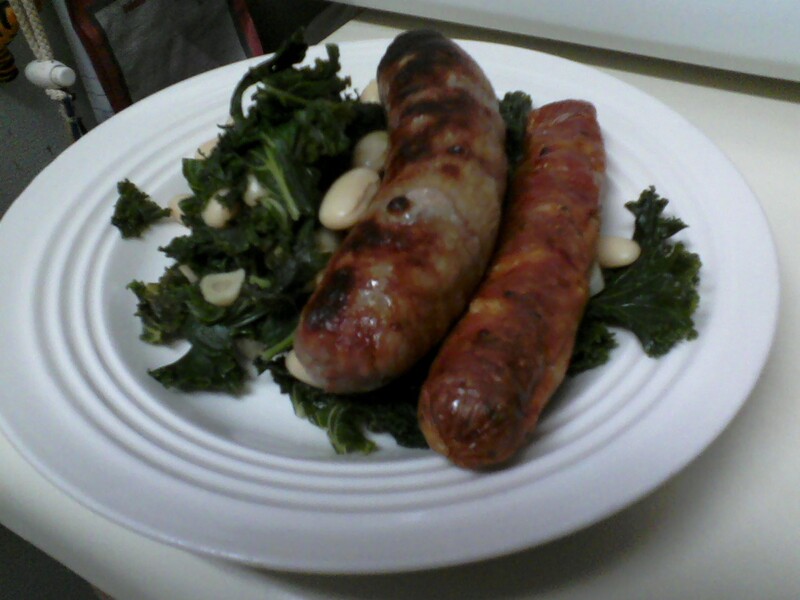 Next up is going to be a sausage and kale recipe with Cannellini beans–my favorite! I don’t have any kale, but that’s OK, I’m not in a hurry. I’ll let you know how that one works out too. I love sausage. Posted by Amy on December 31, 2012 in Cookbooks, Fast & Easy, What's for Dinner? I *used* to have my own sage plant, where I could just pick some, but with everything that happened this summer, it sort of dried up. I’ll get another one again one day. I like fresh sage. Oh, I’ll be making this again. More than once, I tell ya. Probably in the toaster oven, if I can figure out how to make it come out the same way. Then you toss on the sage and cheese, it goes back in the oven, and when it comes out, toss on those chopped dried cherries. Yeah, it’s good. It’s not beef bourignon, it’s not trout almondine, it’s not poached salmon, but it’s good for a quick weeknight meal. Heck, quick meal anytime. Dried cherries are a good thing on this dish, too. I haven’t had acorn squash in a long, long time, I was peeling the skin off the flesh. And I realized it might be edible. Well, heck, I ate the skin, because it was much softer than it was before. So, if you’re game, eat the whole acorn squash, OK? Just get rid of the seeds. Hey–I wonder if I can plant the seeds. Hmmm. . .it’s an idea. If you can find the final issue of Everyday Food, grab it, and turn to page 85 to learn how to make this dinner for yourself tomorrow. Posted by Amy on November 29, 2012 in Cookbooks, Fast & Easy, What's for Dinner?